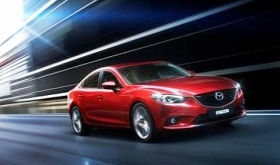 Mazda had aimed to bring a Mazda6 diesel model to the U.S. in 2013. TOKYO (Bloomberg) -- Mazda Motor Corp.’s plans to introduce a diesel car in its most important market risk falling further behind schedule after Volkswagen AG flouted U.S. rules and unleashed global regulatory scrutiny on the technology. The cloudy outlook for Mazda’s U.S. diesel ambitions stands out as an example of collateral damage from VW's cheating on U.S. emissions tests. Revelations that the German company achieved its promise of “clean diesel” by using software to beat laboratory tests not only sullied consumer perception of the cars, they also cast doubt on Mazda’s ability to create an engine that’s both fuel efficient and clean. Mazda’s engineers are trying to develop the Skyactiv-D engine in line with U.S. emissions standards without sacrificing performance, said Michiko Terashima, a company spokeswoman. The company doesn’t have a time frame for introducing the engine but won’t change its plan because of the Volkswagen case, she said. Mazda is the Japanese carmaker most reliant on diesel, with about 45 percent of its domestic sales from diesel models in the quarter through June. By contrast, Toyota Motor Corp. and Nissan Motor Co. have prioritized hybrids and electric vehicles, respectively. Volkswagen disclosed last month that it sold as many as 11 million vehicles worldwide with diesel engines using software that limits full pollution controls to when the car’s emissions are being tested. In normal driving, the cars pollute 10 times to 40 times more than legal limits, according to the U.S. Environmental Protection Agency. Mazda had aimed to bring a Mazda6 diesel model to the U.S. in 2013. While it’s not for sale in the country, the company still promotes the Skyactiv-D engine on its U.S. website with a video that declares they’ve come a long way since Rudolf Diesel invented them in 1893. “No longer sooty, clattering workhorses, today’s diesel engines are quiet, durable and cleaner than ever,” the video says. Mazda notes that diesel’s compromises have included the need for heavy, industrial-strength parts that sap driving performance because the engines run with higher combustion pressures. Cleaning up their nitrogen oxide emissions often necessitates costly after-treatment systems. The EPA has alleged that Volkswagen overcame these issues using a “defeat device.” Mazda claims in its video that Skyactiv-D’s workaround was to lower compression ratios, delay combustion and give fuel and air a millisecond more time to mix, reducing pollutants. Mazda never uses illegal software of “defeat devices” to comply with emissions regulations, the company said Tuesday in an e-mailed statement. The carmaker said it supports countries around the world that are investigating new testing methods based on real-world driving conditions. Volkswagen’s deception will make make it harder for Mazda as the U.S. government was already withholding support for diesel engines, AutoPacific’s Sullivan said.